Mother Nature has been quite the tease this week, giving Columbus empty hopes of an early Spring in the form of 70+ degree weather. Before Ma Nature could pull the proverbial plug by creating a forty-degree drop in temperature, sending panicked, leaky-sinus induced riots to the psuedoephedrine section at the local pharmacies, I decided to take advantage of the weather, and hike at Highbanks Metroparks. Highbanks (located here: http://g.co/maps/g6xrg) is a 1,150 acre haven away from the hub-bub of High Street (Sure, Columbus isn’t at a suffocating L.A., or New York traffic level by any means, but if you mutate into the Hulk due to horrible drivers of C-bus like I do, you can play a little game at Highbanks called, ‘Bring down that escalated blood pressure, kind sir, or you’ll pop a gasket!’). Tangent, sorry, back to the point – Highbanks has become one of my favorite relaxation points in Columbus; it has seven gravel/dirt trails varying from easy to difficult surrounded by peaceful beauty of the hard-wood forest. You’ll see folks, young and old, taking leisurely strolls, jogging – and those brave-souls who do marathons – sprinting by in Spiderman inspired garb, but polite to pant ‘hello’. There are picnic areas which are usually quite crowded on nice-weathered weekends, dog walking paths, and an excellent Nature center where you can learn about the area’s history, geology, and animal-life. One of my favorite hikes starts at the Nature Center in the moderately difficult Dripping Rock Trail (2.5 miles). 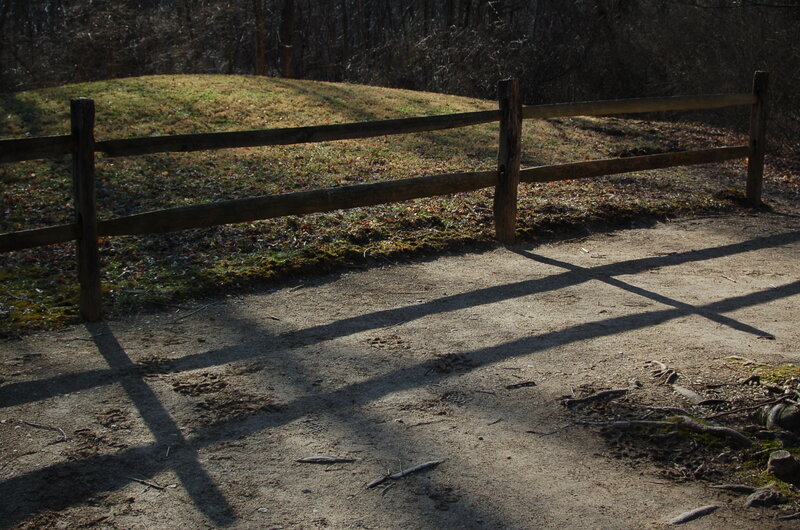 The Trail dips down to an Adena Burial Mound dating back to 700 b.c. It’s an unassuming looking hill, this Adena Mound, and honestly, I would never have noticed it if it wasn’t fenced in and marked with a commemorative plaque. Do not build your house here, Craig T. Nelson. If you happen upon the Adena Burial Mound alone, and you’ve seen the movie ‘Poltergeist’ one too many times in your life, a quick picture, an audible “Sorry to bother” will suffice. I advise quickening your pace in leaving this area. After the Adena Mound – the Dripping Rock Trail heads down to the (2.3 mile) Overlook Trail. A few steps in on the trail, there’s a little unmarked pathway that takes you to the Pool Family Gravesite – a family of frontier-folk who first cultivated the area . The path is difficult to find in the summer, but in the winter you can see the headstones and fence from the main trail. The Pool Family aren’t physically buried there, just the headstones, which is good because you’d have to deal with a full on Frontier-Folk vs Native ghost war on the trail. Overlook Trail rolls along peacefully (the sun-bathed picture in the slider was in this area of the park) over bridges, past Prehistoric Earthworks (an early irrigation system according to the placard on the bridge) to a platform overlooking the Olentangy River. It’s not the most beautiful place during the winter, as the sparsity of tree cover exposes some high tension wires in the distance, but there is still a stark serenity about it; standing on million year old bluffs, or the high banks (namesake! ), taking in the scenery. That is, until fighting squirrels scare you out of your deep meditative state. Back on to the Dripping Rock Trail, marked by a WoodPecker symbol you will pass through the Big Meadows Picnic Area up passed the day camp on the way back around. On the pamphlet for Highbanks, there’s a picture of a bald eagle, poised valiantly, preparing to rip some poor creature’s face off. 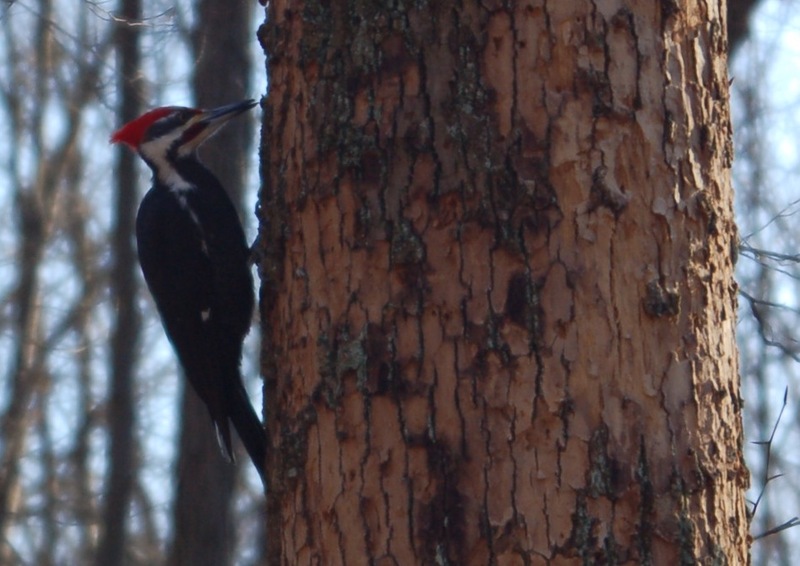 I did not get an opportunity to see a Bald Eagle, but was openly mocked by, coincidentally, a Woodpecker. They do laugh at you in a high-pitched cackle, just like Woody the Woodpecker from the cartoons, but don’t take offense; be magnanimous, for any creature who bangs its head upon a tree repeatedly day-in day-out has no right to mock and is probably just suffering from a chronic concussion. I’m funny how, I mean funny like I’m a clown, I amuse you? I make you laugh? Dripping Rock Trail loops back around to the Nature Center, and if you haven’t had a physically active winter, you’ll be pretty tuckered out. The hike I’ve listed is consistently moderate-to-difficult (approximately 5.5 miles with all the little branching paths), but a great reason to get outdoors to soak up some nature; to get in a free workout outside of a stinky gym; to escape the city, even it’s for just a few hours. This entry was posted in Local Focal Columbus, What to do. Tagged adena mound, best hikes in ohio, columbus, highbanks, highbanks metrobanks, hikes in columbus, hiking, hiking columbus, hiking in ohio, metroparks, poltergeist, things to do in columbus ohio, travel. Previous Post Previous post: Suggested Reading – Bill Bryson’s ‘A Walk in the Woods’. Thank you, kind sir. I’ll try to incorporate as much Goodfellas in this thing as possible. Do love the humor you’ve added in. Made me smile. Nice job my son! Now I haven’t seen it MYSELF, BUT I did recently run across reports of a 7-foot white hairy creature that supposedly lives in the area or frequented it years ago. It’s a local legend that of course isn’t talked about loudly by the park rangers and other staff. I wonder how many of the other trail hikers are aware of the stories…??? I’ve walked through Highbanks many times in the past year and I wondered how easy it would be for a cryptid to hide there. (This was before I found out about the local stories…) There have been times walking alone that I felt it would have been easy to stumble across something you might not want to be around; you can be separated from other human beings for at least 15-30 minutes at a time on the trails. Thank goodness the creepiest things I’ve seen are harmless (non-poisonous) rat snakes. The largest creatures aside from people that I’ve witnessed were deer… I saw a group of six deer cross right in front of me through a trail last fall. You see a lot of deer late summer/fall walking through the trails… especially the southern trails that go deeper into the woods. You’ll see deer grazing in the meadow clearings. All this said, those trails are the last place I want to be when the sun starts to set. I’d try to be out of there before 7, 7:30 in the evening at the latest! Wasn’t aware of any local sasquatch reports, will have to look into this, and watch my back next time I’m over there after dark. Definitely had a run in with a mama dear last time I was there. Beautiful place to be, anytime of year really. Can you please share with me where you have heard stories of the white sasquatch? I’m doing do research on Highbanks Park for a local paranormal research team. We are trying to get permission to go to the park after dark and do some EVPs. I saw your reply to Mike’s blog and it got even more interesting. Pretty sure of there is an over 6ft white beast is there I would like a heads up. It would not surprise me if there were more there than spirits.. Some in the paranormal world believe shamans or Indians can actually take on animals forms after they have passed, as well as unnatural frightening forms. It would be interesting to see if they are linked. So if you could share and links or info you have that would be great! I decided to extend my visit at Highbanks today and walked to the Eagle observation deck. Couldn’t find their nest with my camcorder zoom — had it on 60X digital zoom then switched up to 300X but I still didn’t find the damn nest even though I looked up and down every tree in the right area! Too much leaf coverage! As far as squatch is concerned, what I’ve heard is only what I read online off a Big Foot research site with a ton of documented Ohio sightings and we all know how reliable the Internet can be…! HOWEVER, the Central Ohio area does meet criteria for supporting sasquatch — still plenty of coverage in the woods, lots of farmland in the area (although it’s disappearing and being developed), and plenty of food sources. Besides nuts and berries, there’s plenty of game (badgers, squirrels, gophers, deer, etc.) for eating. (People don’t want to believe wild animals can thrive around human settlements but look at all the deer we have in the area! Also, where there is deer, there are predators and we DO have coyotes in the era. I once saw a coyote running behind the Wal-Mart on Columbus Pike/Rte 23! There were tons of alleged sightings in the 1970s and 1980s in Delaware County and even a few in Franklin County. 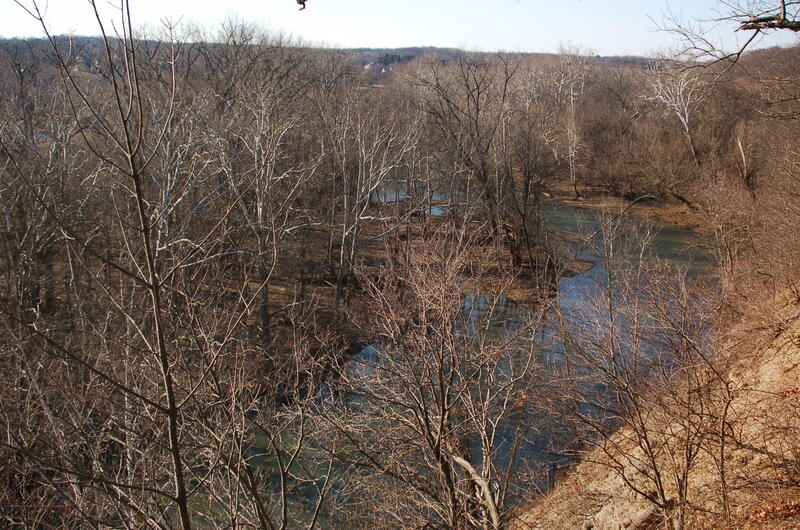 Several sightings happened along the Olentangy River — some teens got spooked by one (1976) when they decided to fool around at midnight and canoe down the river — and at least one documented sighting (1989) near sunset in Highbanks. The Highbanks creature was probably an older one and allegedly followed the hikers that stumbled across it for a little bit. The hikers ran into a ranger who got cross at them and didn’t believe them even though they were obviously freaked out. If squatch were going to show up in the area, I would think it would be late summer/fall. I even have a fair idea of where the crypid — if real — could show up at Highbanks. Probably the meadow area/woods around the meadow off Overlook Trail. It’s roughly halfway to the Eagle observation deck. The deer like to graze there and you can see packs of 6-8 deer with their young and even more at times in the meadow. That would be a perfect set-up for a hunter. Very cool write up, George. I think I learned more from your writing than the actual trip I took to Highbanks. Thanks for this – I’ll watch out for the sasquatch, try to sneak a pick of him (her?). I honestly don’t know what to think about half of the stuff I’ve read. It’s just terrifically WEIRD. On the other hand, I’ve been told it’s best to keep an mind. I do believe that all legends and myths have some basis in reality. Plus, it’s not entirely impossible for an animal/human/lost link to the past(?) 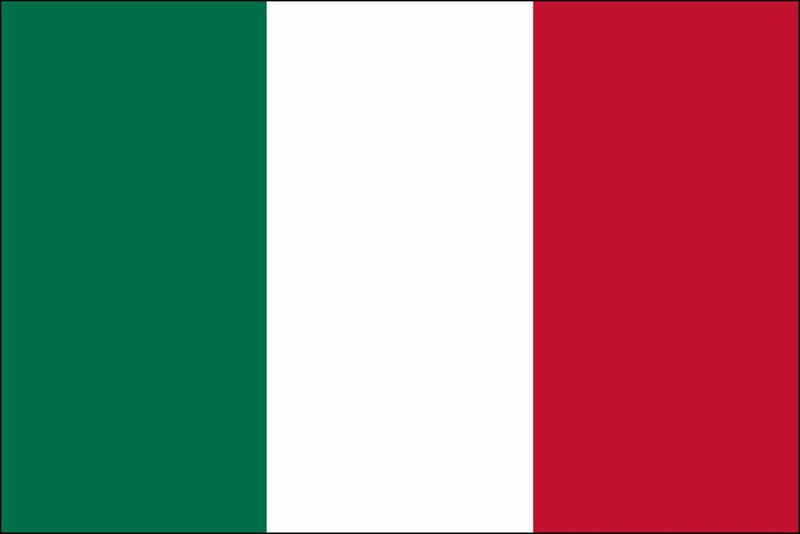 like this to exist. I put the odds at about 30% — the same as the alleged percentage of the US population that actually believes in Sasquatch. 30%, btw, is still a good chance there’s something to this. Reality IS stranger than anything we can make or generally dream up. Just because you don’t see something for yourself doesn’t mean it can’t exist. Religion is based on faith, not artifacts or “confirmed miracles.” Heck, by that standard, most of what we know in science and medicine is faith-based, too! There is a lot more that’s theoretical out there than actual confirmed fact. People over here in the States didn’t believe in gorillas until the first film footage of them and live specimens were brought into the West. There have been animals that people thought were extinct or just legend that have turned up alive and thriving in isolated parts of the world. Most of us familiar with this cryptid are aware that the majority of the sightings take place in the West — either California or Washington state. Well before white man were in the area, the Natives that lived around Mount St. Helens had stories about tall, hairy creatures living in the area. Anyhow, skipping to the present, there’s a rumor that’s spread around on the Internet in recent years. Supposedly, after the huge eruption of St. Helens in 1980, sasquatch bodies were found by workers doing clean-up. Like everything else, they were choked to death by volcanic ash and poisonous gases. The bodies were seized and impounded by the Feds right away but not before gossip leaked out from the clean-up crews who got at least a glimpse of limbs and so forth. Years later, firefighters supposedly run across badly burned or deceased sasquatches in the midst of one of big forest fires out West. They treat one of the still-living creatures but it’s not long again before the Feds come in again and seize it. B.S. or reality? I couldn’t tell you! P.S. — Local legend or not, Highbanks is a bit creepy to hike through on your own. That forest gets thick and I still get lost once in a while. I’ve hiked there two-three dozen times since April last year and I still get occasional chills. There are times you’re totally isolated from other human beings and you don’t see anyone else for at least 15 minutes. The creepiest things I’ve seen are rat snakes… the biggest animals I’ve run across are groups of deer both on Dripping Rock Trail and the meadows off Overlook Trail. Well, hopefully soon I can head up to the Pacific Northwest and do some sassearch if you will. Though illegal, I’m tempted to camp out at Highbanks…. Having had a few weeks to get over “ghost stories” — sorry, but I’ve had an experience or two with the paranormal and have a VERY good imagination! –, I kind of wonder about the “hairy ape” stories. With what little I know about oceanography and all I’ve read about sea exploration — or the extreme LACK of it on this planet –, it’s very likely some very strange things will pop up including creatures that zoologists and evolutionists have told us can’t possibly exist today! The online conspiracy nuts and YouTube crowd do a very nice job of returning you back to reality and showing just how reliable “media” is today! My name is Heather I really enjoyed your blog you definitely have a way of entertaining the readers. So I’m trying to do some research on Highbanks park for a Paranormal Investigation Group. You made a comment about the Arena burial mound and Sandford Selvey making mention of him being haunted to death by pissed off Indians. I was wondering if this is to be true and if you could tell me the source. I would like to get my team out there to do some EVPs and whatever else we can get into. Oh glad I scrolled down before sending. There are also rumors of a large big foot beast? Now we really want to go. 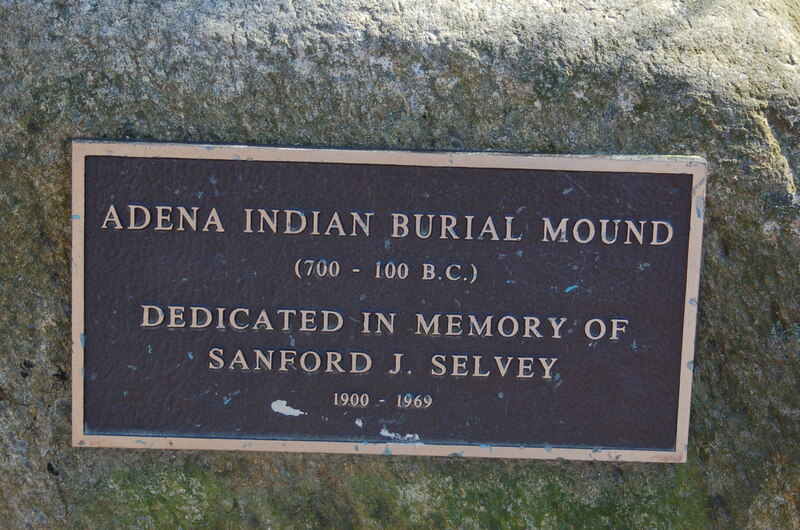 Sandford Selvery discovered the Adena Mounds at Highbanks, and one was named after him. He was not haunted to death. BUT, the area you speak have has gone untouched since it was made by the Adena Tribe (800 – 1200). There was a slight excavation on site, which garnered some pottery items, but they didn’t do a whole dig (ie. find bodies). There’s also an embankment farther back, surrounding the entire Overlook section. A whole tribespeople lived here, and if you were to do EVP work, this and the Selvey Adena Mound would be the best sections. The creature is not a Sasquatch, it is the Mad Tom Creature. You can read about it some in “The Search for Mad Tom,” a book about Highbanks Park. You can read a bit more about the Mad Tom Creature in, “The Treasure of Highbanks Park,” a book about how to use the park for health rather than relying on psychotropic (mind, mood, and behavior altering) substances, sort of like how Mike treasures the park as a get away. One of the naturalists at Highbanks Park will likely know how you can get a copy of those books. Have you heard of an old Native American Legend about the Mad Tom Creature causing people to go missing in the vicinity of Highbanks Metro Park? If you do Please let me know of it. Can’t say I’ve ever heard of that. Mad Tom? Isn’t that a catfish? I visited the Selvey Indian Mound many times as a young boy with my great uncle Sanford Selvey. Never got scared by “Indian ghost” once. Silly story, but not funny! I’d like to say I NEVER saw anything strange in Highbanks but that’s no longer true. The boogeymen are real, I guess… You don’t always see them in the dark. Sometimes they show up in broad daylight. I saw mine for about 15 seconds on a Thursday or Friday, about 2 years ago (2016, I think) in August or September I think. It was 8:45 AM and there was plenty of light. This happened about a mile-and-a-half from the ranger station by the main parking lot of Highbanks. That’s the first parking lot you run into from the main entrance off of State Route 23. I was getting done with a nice walk on the multipurpose paved path and headed back to my car. I saw it about 30-40 feet south of the bench that’s on the part of the path that runs parallel to State Route 23, I saw “it” in a forest clearing. I don’t KNOW what “it” was. I just saw the outline of a humanoid being. I hate to invoke Hollywood but, yes, it was like a “Predator” invisibility effect. Multiple people have seen these things coast to coast in the wilderness and state parks and I have to be one of the jerks to see this in person!!! I honestly believe maybe only one in a thousand people ever say or write anything about this stuff because it’s unbelievable unless you’re there and see it for yourself. I’ve seen videos posted online (YouTube, see cloaked bigfoot — I won’t say that’s what I saw but the cloaked effect was identical) of EXACTLY what I saw with my eyes — the same light-bending effect, refraction of light around the edges, blurry transparency. I know enough about videos from doing my own little experiments and watching plenty of professional films with BAD compositing to say at least two of the videos I saw were not fakes. I know what to look for and the pixels were NOT manipulated. I don’t think “it” moved much but I was at an angle where I could obviously see the outline of SOMETHING in the clearing of the woods. I definitely saw the outline of a head and shoulders and that thing was at least my height, maybe 6 feet but I didn’t get an impression it was that tall or I WOULD have been more freaked than I was. I can’t say it was bulky — lean might be a better description. It was like one of those things you barely notice but then it hits you later that, “Yeah, I saw something strange!” It was probably looking in my direction, too, and was fairly passive. It probably never expected anybody would see it and I think in most cases people WOULD walk by it if the conditions weren’t right like mine were. You could definitely see it wasn’t perfectly transparent. Again, the light was refracted around the edges and the things behind it were blurred. You’d never expect to see something like this in real life but it was there. I DID NOT APPROACH IT, ATTEMPT TO GET CLOSER, AND STAYED ON THE PATH LIKE A SANE PERSON WOULD HAVE AND WALKED AWAY FROM IT!!!! I don’t know what this thing was. I just saw an imperfect cloak, something that was definitely out of place in the woods, something that I would NEVER associate with the area. That park will never be the same for me and I will never feel completely comfortable there after that! It happened so quickly and was over like that. I don’t think I stopped walking the entire time and after I passed the clearing (I was WAY over on the other side of the path from the clearing!!!) I got around the bend of the path on the straightaway of the path towards my car. I warned two ladies going in the direction of where I left to be careful but I was vague. What was I supposed to say to them? I saw the boogeyman? I wasn’t even sure and I was still in shock over it! This isn’t the kind of thing you report to the authorities because they’ll think you’re nuts. The other more cynical side of me says they don’t WANT these kinds of things reported because their parks generate money and this is a major spot for people to hang out and picnic over the weekends and holidays! The last thing they’d want to report is anything like monsters or whatever the hell that thing was I saw! Oddly enough I didn’t run from the thing. My feeling with wild animals is that the worst thing you can do is panic and show obvious fear. You won’t outrun most of them anyway. Again, I don’t know what I saw. “Humanoid” is as good a word as any. It definitely wasn’t a bear and I doubt the military was testing stealth technology in the area. The fear really hit me AFTER the event. I don’t want to say that I ever felt my life was in danger but it was not a comfortable feeling running up against something unknown and knowing that I was alone with IT for at least another minute or two before I ran into two other human beings who I will remind you I DID warn vaguely. I doubt they saw it because I think it moved on after I passed through and it was a million-in-one chance that I saw this thing. The conditions were just right for me to pick it out in the forest clearing. Frankly, I don’t think you’ll see what I saw. I went through Highbanks, on the paths and all over at least 50 times in five years. I only saw this thing once… I visited the park maybe 12-14 times after the event. I haven’t been back in close to a year I think.